Quick, delicious Chinese Garlic Green Beans are a family favorite – just like takeout green beans but so much better! Bursting with garlic and onion flavor that is so rich and delicious you’ll want to lick the pan! When I get takeout, I will admit vegetables are never the first thing I think to order. It’s not that I don’t LOVE vegetables from Chinese food restaurants – I seriously do – it’s just I tend to focus on the main dish and sort of end up ordering some random veggie on the side to make me feel less fat while I fuss over piles and piles of decadently greasy comfort food. Except for Chinese style green beans. When I know a restaurant has particularly good green beans, I could make an entire meal out of just those!!! And Chinese Garlic Green Beans are one of the easiest things to make at home – and just about the only green bean preparation my kids will eat without much fussing. Just Take Me To The Best Chinese Style Green Beans Recipe Already! 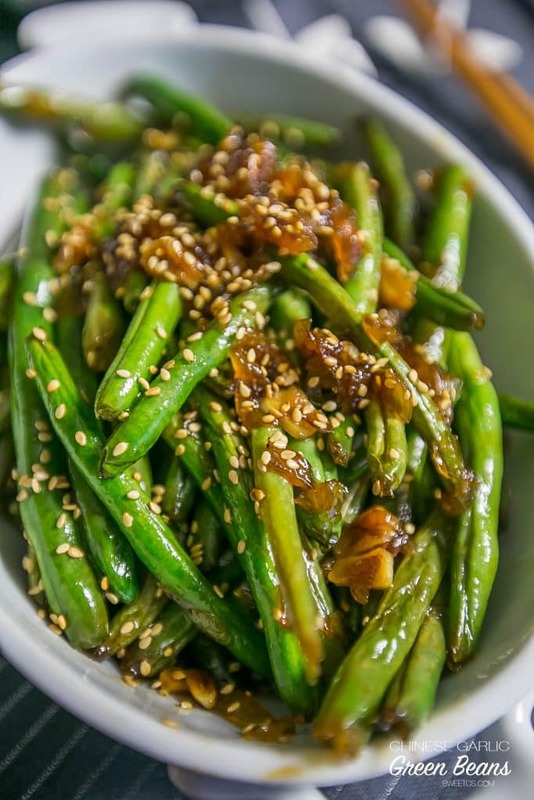 If you want to get straight to the Best Chinese Restaurant Green Beans Recipe and skip over my helpful tips and tricks and similar recipe suggestions, please scroll to the bottom of the page where you will find the easy printable recipe. I get a lot of questions and comments and requests for similar recipes or recipes to cook along with this dish, so I try to provide as much information into my posts as possible. If you’d like to get straight to it, please scroll to the bottom of the post just above comments! 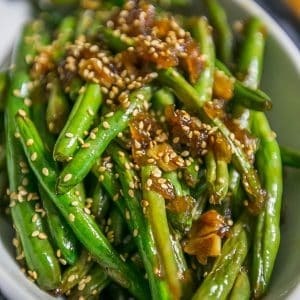 This garlic sesame green beans recipe is easy and simple – but there are a couple tips and tricks to be sure you get perfect Chinese Restaurant Green Beans every time! This recipe is a very adaptable dish – if there is something you’d like more or less of, try it out! Want more ginger? Add some! To get the best results, taste as you go, and don’t be afraid to try new flavors. Just be sure to add any ingredients slowly – a little at a time – since you can always add more, but can’t take additions out after you add them. -Cook Green Beans to Your Preferred Doneness. People prefer green beans at different levels of doneness – I prefer mine slightly crunchy, but I have friends who like them limp and soft. For the best green beans, cook them to your preferred doneness – not the times I list below. Since there is no meat in this dish, you can cook this in more or less time without worrying about the internal temperature of the green beans, so cook it to the texture you prefer! This recipe can also easily be turned vegan and lent-friendly (without oil). For the oyster sauce, opt for a vegetarian/vegan brand (there are many – it is made from mushrooms instead of oysters) to make this dish vegan. If you’re avoiding oil for lent, you can simply skip the oil and toss the garlic and shallots directly with the green beans. Reduce your heat to medium instead of medium high so your green beans, shallots, or garlic don’t stick to the pan! I am a big believer in letting vegetables caramelize and soften to boost their flavor without adding calories – let your onions and green beans cook in a pan that is big enough that they aren’t crowded on top of each other. Allowing your vegetables to have more space in a pan helps keep the pan hot, so vegetables brown instead of boiling. If you love these one pot Chinese style green beans, you’ll love some of my other favorite easy family-friendly dishes based off my favorite Asian restaurants! 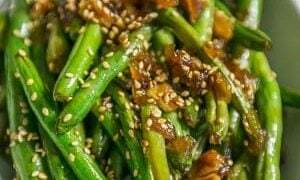 If you love this garlic sesame green beans recipe as much as I do, please write a five star review, and be sure to help me share on facebook and pinterest! 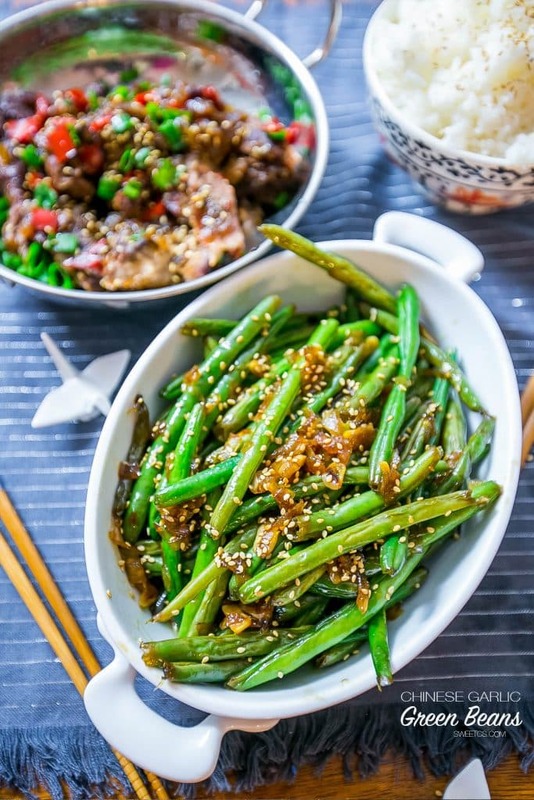 Quick, delicious Chinese Garlic Green Beans are a family favorite - just like takeout green beans but so much better! Bursting with garlic and onion flavor that is so rich and delicious you'll want to lick the pan! In a large, heavy pan, heat oil until shimmery. Add shallots and garlic, sitr frequently to prevent burning. When shallows and garlic have browned slightly, add green beans and toss. Cook about 8 minutes, until green beans start to soften. Deglaze pan with rice wine, stir well. Add sauces and ginger, mix. Taste to see if the dish needs any salt (do check- or it might get too salty). When green beans are as soft as you'd like them, remove and plate! When we go out to eat, i go straight to the greenbeans. I’ve looked at several recipes and this one really caught my eye. I also like the fact it can be vegan. My brother in a is a full fledged vegan. I’m going to surprise him with this dish. He will be very happy. I’m very excited to make it on my own. Do you have more vegan recipes? I’ve been thinking about trying g it, but I haven’t found my tasty recipes. Everything is so bland. Thank you for sharing. I am browsing for green bean recipes for Thanksgiving. I was surprised to see an option for an oil-free lenten choice. You must be Orthodox! I’ll be following for more great lenten foods. Thanks! We are, Niki! I dont blog a ton of Orthodox fasting foods because frankly they don’t always get searched – but if you ever want to chat recipes please email me! I dont always post my fasting recipes but I have a bunch I love! Made this tonight, it was sooooo delicious! We absolutely loved it, thanks for posting! Absolutely Fabulous!!! Thanks for the recipe!!!? Made this tonight to accompany orange sesame chicken. I was out of rice wine and oyster sauce so I substituted brown rice vinegar and hoison sauce for them, respectively–very tasty and the hoison helped balance out the bitterness of the vinegar. 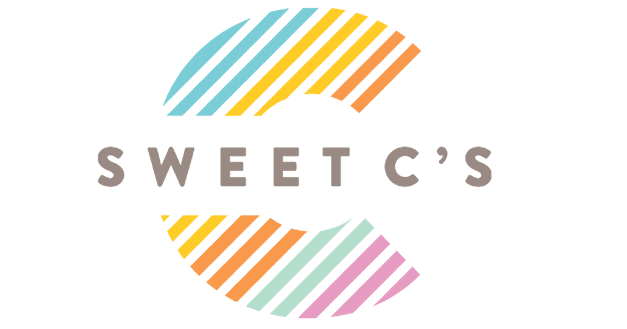 Can’t wait to try this with all the right ingredients! ? How do you prepare the ginger? I have only seen ginger in the veggie area of the stores… Can I find it as a sauce? Made this tonight along with the Sweet Chili Soy Glazed Salmon and both were excellent! I did make some substitutes since I didn’t have all the ingredients on hand; 1/2 red onion for shallots, and fish sauce for oyster sauce. Turned out great. Thank you for the recipes! Lovely recipes. Thank you and Happy Easter. Thank you so much Liz! I hope you come back and try some more- Happy Easter to you and your family!